Campbell enclosures are designed specifically for data acquistion applications. The white color reflects solar radiation, which reduces thermal gradients within the enclosure, a potential source of error in thermocouple measurements. 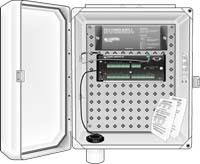 The backplates have a grid of 1" on center holes that corresponds to datalogger and peripheral mounting brackets, allowing you to easily mount the equipment in the enclosure, yet quickly change the equipment placement later.